Mr. Anuj Dalmia is the Founder & CEO of Akruti Financial Planning Solutions Pvt Limited. He is an alumni of Goa Institute of Management, Panaji as Management graduate and Madan Mohan Malviya Engineering College as Electronics Engineering Graduate. A financial and Management expert with more than two decades of experience, he is passionate about helping people and families plan, create and manage their wealth. 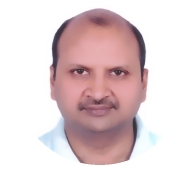 With a vast experience in the field of financial planning and management, he has advised hundreds of customers, both individuals and Corporates who entrust all their money related matters to him including transition from employment to business ventures, business setup and support services to new and first generation entrepreneurs. His working areas are Business Management, Financial Strategy & planning, Family money management, Salary Structuring, Income tax, Property Advisory, Insurance advisory, Estate and succession planning, Business setup and Support Services etc. He is ably supported by his team of transaction executives and subject experts who are leading professional in their respective fields – be it Real estate, Taxation, Insurance, Mutual Funds, Stock markets or any other field of Business and finance.